The second quarter of 1976 was both action packed and eventful for fans of Mid-Atlantic Championship Wrestling. Major championships changed hands often during this time period. The World Tag Team Titles, the Mid-Atlantic title, and the Mid-Atlantic TV title all changed hands multiple times during this quarter. However, the United States title was kept in the vice-like grip of the big Texan Blackjack Mulligan for the entire quarter. Mulligan was a dominant force during this time frame. The feud between Wahoo McDaniel and Nature Boy Ric Flair heated up like the weather as this quarter progressed. This feud blossomed into perhaps the greatest in Mid-Atlantic history, and is a feud that Ric Flair to this day calls one of his toughest and best. Some of the best matches ever between these two occurred during the 2nd quarter of 1976. No major names left the area during the April-June 1976 period, but a big name did make his way into the area. Dino Bravo was one of the most impressive new-comers the area had seen in years. What great things would lay in his future! And soon! The month of April 1976 saw the crowning of a new Mid-Atlantic TV Champion, and as was said earlier, the bursting on the scene of a fantastic new-comer to the Mid-Atlantic area. 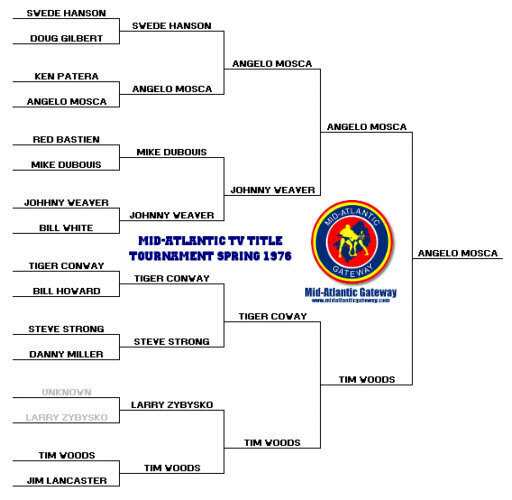 The tournament to crown a new Mid-Atlantic TV champion had been ongoing since February of 1976. By the time April rolled around, the finalists for the prized belt were "Madman" Angelo Mosca and "Mr. Wrestling" Tim Woods. Mosca had defeated Johnny Weaver in the semi-final round of the tournament in controversial fashion via a count out. Woods advanced by defeating Tiger Conway in the other semi-final in a rare match-up of "good guys". The TV title match was held in the WRAL studios in Raleigh NC on April 14, 1976, and aired three days later. Bob Caudle had a special co-host on that program, Mid-Atlantic Champion Ric Flair. A great match ended in rather lame fashion as Mosca defeated Woods by using a handful of tights. Woods whined after the match, vowing to have the NWA review the ending of the match, but ultimately the decision stood. Mosca would hold the belt until the last day of this quarter, June 30, 1976, when he would drop the belt in the WRAL studios to Paul Jones. TV TOURNAMENT BRACKETS - A Gateway Exclusive! April saw NWA World Heavyweight Champion Terry Funk come back to the area for a series of matches. In fact, Funk wrestled a very rare "main event" type match against the great Indian Chief Wahoo McDaniel on Mid-Atlantic TV. Even rarer, Wahoo beat Funk cleanly in their televised match which aired on April 24, 1976. Regrettably, for the majority of fans, the McDaniel victory was in a non-title bout! April of 1976 also saw a great new-comer enter the area. Dino Bravo hit the ground running as he first appeared on Mid-Atlantic Wrestling TV on April 24, 1976, defeating Steve Strong. On the same show, Bravo came out and confronted Gene and Ole Anderson. The Andersons were brutalizing the arm of Randy Colley, Bravo took exception, and the fireworks began! Before the show ended, Bravo had secured a World Tag Team title match with the Andersons! The following week on Mid-Atlantic TV, Bravo enlisted the aid of "Mr. Wrestling" Tim Woods to be his partner against the Anderson in the title match that would air on Mid-Atlantic Wrestling TV on May 8, 1976. May of 1976 started with a bang as the "Challenge Match" for the World Tag Team Titles between Gene and Ole Anderson and Tim Woods and Dino Bravo on Mid-Atlantic Championship Wrestling TV aired around the area on May 8, 1976. A major upset occurred as Woods and Bravo upended the Anderson’s and became World Champions. Tim Woods now had his white mask back on and was referred to as "Mr. Wrestling." May saw some great matches for the World belts as the Anderson’s desperately attempted to reclaim their titles. Mr. Wrestling and Dino Bravo proved to be worthy champions as they performed well during their run as champions. Ole Anderson had a particularly rough month of May. Ole’s thumb was injured by Mr. Wrestling and Bravo during a match in May, resulting in a cast being put on Ole’s arm. Ole, of course, used the cast to his advantage in many matches thereafter. In fact, the cast played a role in story lines through late September, when the Anderson’s left the Mid-Atlantic area. In an incident that received a good bit of mainstream media attention, Ole Anderson was stabbed in the chest by an irate fan in Greenville, SC following a match with Tim "Mr. Wrestling" Woods and Dino Bravo. Luckily the injuries Ole received were not serious, and the big man from Minnesota didn’t miss a beat. Ole even mentioned the stabbing on a late May show of Mid-Atlantic Championship Wrestling, saying that the incident would make he and Gene more determined than ever to win the World belts back from Dino Bravo and Mr. Wrestling! May was also the most active month in the year long feud between Ric Flair and Wahoo McDaniel. Wahoo defeated Ric for the coveted Mid-Atlantic Heavyweight Title in early May, but Ric came back to reclaim the title on May 24, 1976 in Charlotte, N.C. in controversial fashion. During their championship bout in Charlotte, the action spilled out of the ring and Ric threw Wahoo onto a table. The table collapsed and Flair picked up one of the legs of the table that had an exposed nail in it. The "Nature Boy" drilled Wahoo with the table leg, inflicting two huge lacerations on Wahoo’s forehead that took 40 stitches to close. Ric took advantage of the blow to the head with the table leg to defeat Wahoo and once again capture the Mid-Atlantic Heavyweight crown. Wahoo vowed revenge, and this classic feud was far from over! 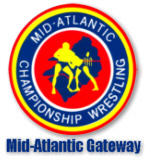 The month of May closed with a special show of Mid-Atlantic Championship Wrestling over Memorial Day weekend. Special because the legendary Johnny Valentine returned to the set of Mid-Atlantic Wrestling, serving as a color commentator with Bob Caudle. Johnny said he would return to the ring someday, and no doubt all who heard his words that day fully believed him. While as it turned out Johnny was unable to return to active wrestling after the plane crash, he is remembered by his many fans as a true champion inside the ring as well as outside the ring. June of 1976 saw an influx of new talent to Jim Crockett Promotions, though not any newcomers to the main event ranks. June also saw two titles change hands, and a number of dominating performances by the United States Heavyweight Champion, Blackjack Mulligan. June saw a bolstering of the mid-card ranks in the area, as big Jerry Blackwell, Hans Schroder and Red Bastien came to the area. All three of these newcomers got off to a fast start upon their arrivals. Bastien even teamed up with none other than the "Eighth Wonder Of The World," Andre The Giant, in Bastien’s first television match on Mid-Atlantic Championship Wrestling! Unfortunately, none of these three newcomers would ever rise above mid-card status in Jim Crockett Promotions. June of 1976 was probably the best month in the Mid-Atlantic career of U.S. Champ, Blackjack Mulligan. Mulligan defended his title often during June, primarily against the challenges of Paul Jones and Rufus R. Jones. Mulligan dominated Paul Jones to the point that Paul would go into a short program with Angelo Mosca over the Mid-Atlantic TV Title, before making another major push for Mulligan’s U.S. Title later in the year of 1976. June would see Wahoo McDaniel heal up from his forty stitches at the hands of Ric Flair, and gear up for a summer long push to get revenge against Ric and reclaim the Mid-Atlantic Heavyweight crown. At least for the month of June, Flair was able to withstand McDaniel’s onslaught. The end of the month of June saw a major title change hands as Gene and Ole Anderson reclaimed the World Tag Team Titles from Dino Bravo and Mr. Wrestling. The title switch occurred in Greenville, S.C. on June 28, 1976. These four had some terrific battles throughout the month of June. The Anderson’s took the titles back with assistance from the cast on the arm that Ole continued to wear. Ole hit Mr. Wrestling with the cast, and Gene fell on a knocked out Mr. Wrestling to capture the fall in Greenville that won the belts back for the Anderson’s. The winning maneuver was well disguised by the Anderson’s, and the film of the match was not clear enough to overturn the result despite an official protest by Bravo and Mr. Wrestling. The Anderson’s win would set up the remainder of the summer of 1976 as a battleground between these two teams for the NWA World Tag Team Titles. The last day of the month, June 30, 1976, saw yet another major title change hands! Paul Jones took the measure of "Big Nasty" Angelo Mosca and captured the Mid-Atlantic TV Title. The title switch occurred on Mid-Atlantic television in the WRAL studios in Raleigh, N.C. The week before, Mosca had told the TV audience that Paul previously had the TV belt taken away from him by the NWA because he would not travel and defend it. That statement was incorrect, and Jones came out and confronted Mosca. The back and forth between these two got quite heated, and Mosca slapped Jones setting up the challenge match for June 30, 1976. This championship match had one of the strangest stipulations ever as Jones vowed that if Mosca beat him by pinfall or submission, Jones would "get out of Mosca’s hair and leave him alone!" Jones pinned Mosca, but Angelo got the last laugh of sorts by piledriving Jones on the belt after the match had ended. A wild way to end what was truly a wild month of June! BLACKJACK MULLIGAN—The big Texan from Eagle Pass dominated all comers and remained the United States Heavyweight Champion for the entire second quarter of 1976. Mulligan handled the challenges of Paul Jones and Rufus R. Jones convincingly, and was beginning to look almost unbeatable. Blackjack also did some of his best mic work ever during this time frame. There was no question that Blackjack Mulligan was still hot and was Jim Crockett Promotion’s top star during the spring and early summer of 1976. DINO BRAVO---Bravo came out of nowhere to capture one half of the World Tag Team Titles within two weeks of entering the area! Bravo and his tag team partner, "Mr. Wrestling" Tim Woods made a solid team that gave Gene and Ole Anderson all they could handle during the second quarter of 1976. Bravo did not have great skills on the mic, but his physique and work ethic made him a fine performer and justified the quick push from the Crockett bookers. Pairing Bravo with a veteran like Tim Woods was the perfect way to get Dino off to a rousing start in his early months in the Mid-Atlantic area. RIC FLAIR---The "Nature Boy" showed everyone that he was better than ever after the October 1975 plane crash. This three month period was Ric’s coming out party, as he clearly showed everyone that he would be a major force in the business for years to come. Flair held his own with the great Indian, Wahoo McDaniel, and in fact controlled the Mid-Atlantic Heavyweight Title for nearly the entire quarter. His title victory over McDaniel in Charlotte on May 24, 1976 via a table leg was talked about for years to come. Ric Flair was on a roll, with no end in sight! TONY ATLAS---The muscleman from Roanoke, Virginia just could not hit his stride. Tony had great athletic ability and a strong personality, but nothing jelled for Atlas during this time frame as Tony stayed mired in the lower recesses of the mid-card ranks. In fact, it wasn’t unusual at all for Tony to drop bouts to opening-card wrestlers during the second quarter of 1976. Atlas had a ton of potential with all the muscles, as well as a good relationship with George and Sandy Scott. It was very surprising that Tony did not get a push of some sort during this time period. But it never happened. STEVE STRONG---Strong was another muscleman who just couldn’t get it together. Steve continued to drop through the ranks of Mid-Atlantic Championship Wrestling through the second quarter of 1976, after an impressive, albeit short, run as a main event performer in late 1975. Strong left the Mid-Atlantic area in May of 1976, and during his time in the second quarter he put over established stars in TV matches while jobbing to lesser talent in the arenas. A sad farewell to a wrestler who had so much talent and looked to have "star" written all over him. THE MONGOLS---Bolo and Geto were hot in the first quarter of 1976, but not so much so in the second quarter. The losses began to creep in with some regularity, and the twosome got very little TV interview exposure. This was so even with their having a great mouthpiece as a manager, Professor Boris Malenko. Any combination of Johnny Weaver, Tiger Conway and Ronnie Garvin were giving Bolo and Geto all they could handle in the mid card tag team ranks. In fact, Sgt. Jacques Goulet and Mike "The Judge" Dubois took over the top mid card heel team designation from The Mongols during the second quarter of 1976. All the promise that the Mongols brought in from the IWA did not seem to be realized in Jim Crockett Promotions during this time frame.